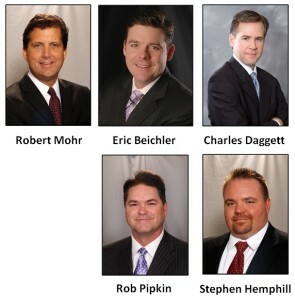 Mohr Partners, a global corporate real estate advisor, announces that five Managing Principals and Managing Directors were named to D CEO Magazine’s 2013 Power Brokers List: Robert Mohr, Chairman, Eric Beichler, Managing Principal, Charles Daggett, Managing Principal, Rob Pipkin, Managing Director, and Stephen Hemphill, Managing Director. The 2013 D CEO Power Brokers were selected by North Texas commercial real estate firms according to the individuals who generated the most revenue for their companies in 2012. Robert Mohr founded Mohr Partners in 1986 with a single office located in Dallas, TX. Now in its 27th year of operation, the company recently expanded into Canada with an office in Toronto. Mr. Mohr has overseen the company’s growth in becoming one of the largest U.S. based Corporate Services Real Estate firms in the country. Eric Beichler joined Mohr Partners 19 years ago and was promoted to Managing Partner in 1998. As a Principal of the firm, he has been instrumental in many areas of the company as it has experienced substantial growth through recruiting, client sourcing and retention. Mr. Beichler was recognized as Mohr Partners’ Broker of the Year in 1997 and 2002, and Partner of the Year in 2005. Charles Daggett joined Mohr Partners in 1995. He is a recognized leader in the Corporate Real Estate Advisory Services field, with vast experience representing primarily Fortune 500 and Fortune 1000 clients. As a Principal of the firm, he serves on its Executive Management Advisory Board with responsibilities in oversight of the firms’ national offices. Mr. Daggett was recognized as Mohr Partners’ Partner of the Year in 2010.
corporate, national and local clients in all aspects of their real estate needs. In recognition of his leadership and hard work, he was named Mohr Partners’ Broker of the Year in 2009, 2011 and 2012. Brokers Under 35 listing. In recognition of his leadership and hard work, he was named Mohr Partners’ Mentor of the Year in 2006 while serving as a Co-Manager of the Business Development Group Department, and Broker of the Year in 2007.